Paperback with 17 full page illustrations. A collection of forty-five modern riddles, cunningly crafted in the Old English poetic style. 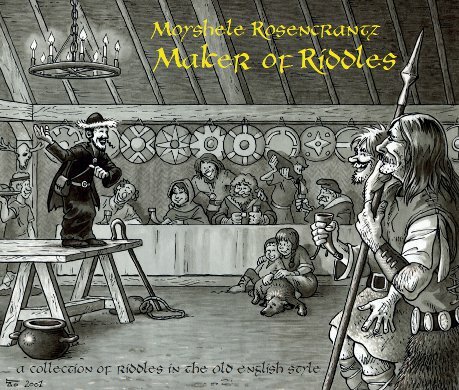 Includes 17 full-page illustrations by Philippe Tauzin, bringing the stories told by the riddles to life. An example of a riddle can be found on the riddling home page. The riddles - little poems to be fair - generally describe simple, everyday objects, in the first person, but do so in such a way as to purposely lead the reader astray. They take us back to Anglo-Saxon times, when itinerent bards travelled from mead hall to mead hall, sharing their own compositions and those which they had picked up along the way. Indeed, the riddles form an ideal game for any family gathering, where young teenagers and adults alike delight in the challenge of guessing. Recommended Age: 18+. In keeping with tradition, some of the riddles contain suggestive sexual imagery. Although the actual solution is quite innocent, the material may be considered inappropriate for younger audiences. All material on this page is protected by copyright. Copyright © 2012 by Moyshelé Rosencrantz.